Celestron Astromaster 114EQ Review - Not Recommended! Celestron’s AstroMaster 114EQ is arguably the worst product in the AstroMaster line and second to only the dreaded PowerSeeker 127EQ as the worst telescope Celestron actually advertises as a serious piece of equipment. 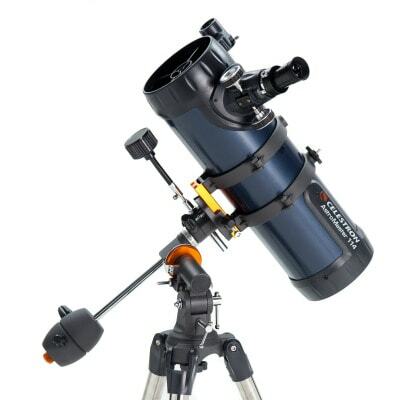 Like the 127EQ, it is frequently positively reviewed by people who are ignorant of its idiotic optical design and have never actually used it, or by newbies have never looked through any telescope before, and as a result, the AstroMaster 114EQ is a best-seller from most retailers despite having absolutely no right to be such. Let’s move on to a deep review of Celestron Astromaster 114EQ reflector telescope. What's Lacking In The AstroMaster 114EQ? The AstroMaster 114EQ is a 114mm “Newtonian” reflector with a focal length of 1000mm. This should immediately raise some eyebrows, as the optical tube of the telescope is obviously way too short to accommodate such a focal length. So what’s going on? Well, you see, the AstroMaster 114EQ isn’t actually a Newtonian. It’s a Bird-Jones (or Jones-Bird, depending on who you ask). As originally designed by Bird and Jones, this catadioptric design uses a spherical primary mirror with a corrector lens just before the secondary mirror. This design allows for the secondary mirror to be shrunken down, the primary to be an easy-to-make sphere, and allows for a stout and short-tubed telescope which has a long focal ratios and next to no coma – at the time, eyepieces were simple and coma correctors nonexistent, so focal ratios tended to be on the long side to achieve sharp images. The Bird-Jones design is outdated and no longer needed – the cheap Kellners supplied with many entry-level telescopes today would’ve amazed a 1950s amateur with their quality and work well enough with even a relatively fast focal ratio telescope. 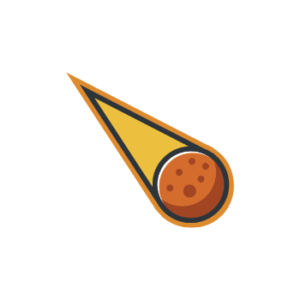 But furthermore, Celestron didn’t even bother to execute the design correctly. For one, Celestron’s Bird-Joneses place the corrector lens inside the focuser. This causes two problems: One, it can’t easily be removed, which is basically required to collimate the telescope precisely and achieve sharp images. Two, it means that the spacing between the corrector and primary mirror is not fixed but instead constantly varies depending on what eyepiece you’re using and also whether you’re even slightly nearsighted or farsighted. The problems don’t end here, though – the correctors in these scopes are incredibly cheaply made and aren’t remotely close to the right shape, being glorified cheap Barlow lenses. In effect, the AstroMaster 114EQ is a fast Newtonian with a spherical primary mirror and a permanently-mounted Barlow lens affixed to the focuser. As a result, it cannot achieve decent images even when well-collimated, which itself is hard to do. Moving on to the mechanical aspects of the OTA, we come to another problem: the plastic castings. The giant casting with the AstroMaster logo that protrudes nearly halfway along the tube, as well as the area around the focuser, means that you cannot slide the tube in its rings to achieve balance on the declination axis in most situations, which strains the mount and is a nuisance while observing as you always have to tighten the declination axis. The focuser on the AstroMaster 114EQ is a modest, functional 1.25” rack and pinion, mostly made of plastic apart from the knobs. The finderscope is a standard “StarPointer” red dot finder, though until recently most AstroMaster scopes had an obnoxious, often-faulty built-in red dot finder. The 114EQ comes with standard tube rings and a very short Vixen dovetail, which would allow you to put the scope on a different mount, although this is something like the equivalent of putting very nice wine on a 50-cent bowl of ramen. One of the rings has a captive ¼ 20 knob so you can piggyback a DSLR camera on top, but this will further wreck the balance and is too much for the mount to handle anyway. The AstroMaster “Newtonians” all come with a 20mm “erecting” eyepiece just like the PowerSeekers for low power. It is almost entirely plastic, has a narrow field of view, and isn’t sharp in the slightest. Celestron includes this eyepiece solely so they can sell it at “nature and science” stores and the like under the premise of it being capable of terrestrial viewing. The other eyepiece included with all AstroMaster telescopes is a 10mm Kellner. It works fine in most other telescopes, though the 114EQ is, of course, incapable of delivering a sharp image with it. 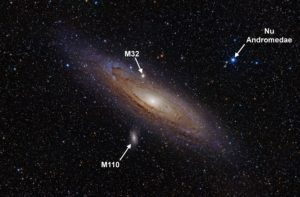 The mount Celestron supplies with the AstroMaster EQ telescopes is the same “CG-3” (though some literature refers to it as a CG-2, and Celestron’s “CG” numbering system is so confusing they should really just ditch it and stick with the EQ1, EQ2, EQ3, EQ4, EQ5, EQ6, EQ8 system everybody else uses). It’s a run-of-the-mill cheap German equatorial design with tiny useless setting circles that are little more than decoration, 1.25” tubular steel legs, and lots of plastic castings on the tripod. The CG-3 has a Vixen saddle so it can accept other optical tubes interchangeably with no tools needed. The CG-3 has flexible slow-motion cables for both axes and fine adjustments in altitude and azimuth for accurate polar alignment. 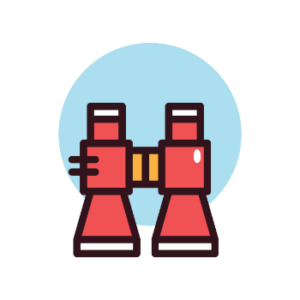 You can also equip the mount with Celestron’s “logic drive” for hands-free tracking. 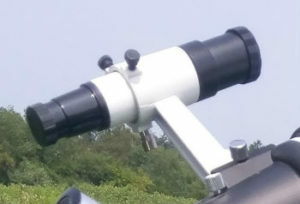 German equatorial mounts can often place the eyepiece of a Newtonian in awkward positions, and you must rotate the tube in its rings to reposition it somewhere more comfortable. Normally, when doing this you’d have to worry about accidentally sliding the tube forward or backward when the rings are loosened and ruining the declination axis balance, but since the optical tube can’t really slide far in either direction and the balance is so messed up anyways this is more or less a nonissue. The optics in the AstroMaster 114EQ are so bad you can completely forget taking decent pictures with it. Even were this not the case, a camera, whether directly coupled or piggybacked, will ruin the balance and strain the CG-3 mount too much. The AstroMaster 114EQ may be slightly better than its cousin the PowerSeeker 127, but not by much. It is like a toy bicycle – it looks like a bicycle, feels like a bicycle, and indeed, you can actually ride it just fine. But hop on a real bike and you’ll immediately notice the difference. The same goes for the difference between the AstroMaster 114EQ and a real, quality telescope. In short, please don’t buy this telescope, and if you already did so and are reading this review for reassurance, I would recommend canceling your order or returning it. what entry-level telescope that can take photos do you recommend-and thanks for saving me from buying the 114eq.